As states and cities face increasingly limited budgets, tough decisions about service cuts loom. 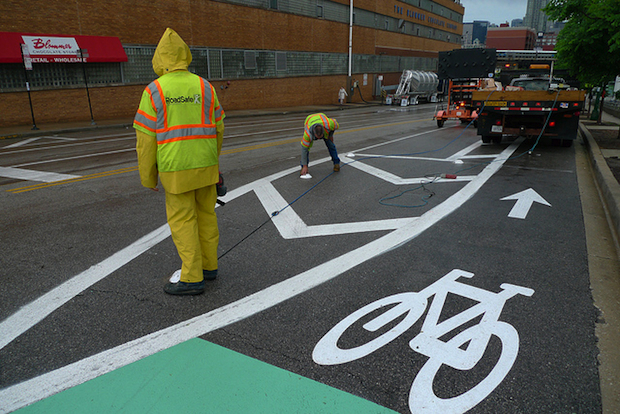 Some people might get frustrated when they see government workers painting out a new bike lane; what was sacrificed to keep those self-important cyclists a little safer? But in reality, bike and pedestrian infrastructure projects generate more than just peace of mind. They also generate 46% more jobs than car-only road projects, according to a new study. of 11.4 local jobs for each $1 million spent. 7.8 jobs per $1 million. jobs per $1 million of spending. And so, the latest study’s authors reason, encouraging walking and cycling can do more than just cut down on car-based CO2 emissions and obesity rates. They can also “address the problem of unemployment, by creating jobs for engineers, construction workers, and workers who produce the asphalt, signs, and other construction materials.” So next time someone argues that bicycle facilities are a waste of money, tell them to think of the job opportunities.